Get private messages on the fly with our ajax powered messaging drop down for your vBulletin, allowing you to send and receive messages without leaving the page. 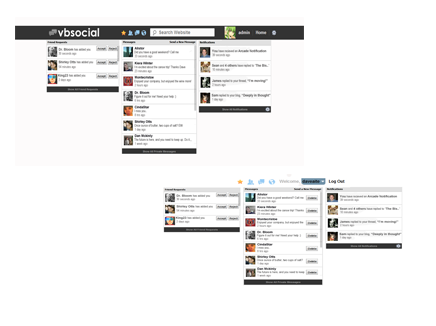 Monitor and respond over 25 different types of notifications for vBulletin and third party modifications. The username drop down includes a powerful ajax pop-up feature allowing users to change their avatar without leaving the screen. 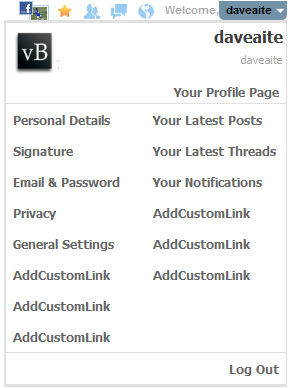 Ability to add custom links and disable all the other header links. Only moderators can see this, but now they will get live updates when to moderate new posts, new threads, and other items that need moderation. Not only does this make their lives easier, but the work processes faster too. Accept new friends from the drop down system. Sometimes, a thread/post you participated in, no longer interests you, but will continue to give you notifications. Enabling and disabling notifications per post will do the trick for you. In 7.0, we’ve created something similar to Facebook’s unique navigation system. A fixed header that will follow your user down the page, easily assisting navigation. The header system can be customized to fit fluid themes and fixed themes. In addition, you can switch between the notifications header, and the legacy notifications look. You you can remove your existing header with the click of one button in our control panel, and replace it with just our Notifications system header, allowing for a clean, efficient look. Logging into a website should be efficient. In 8.0, a login system compatible with Facebook Connect and Remember Me function has been integrated for users making new registrations and existing logins more appeasing to the eye. Easily add custom links to your user menu to direct your users where you want them. 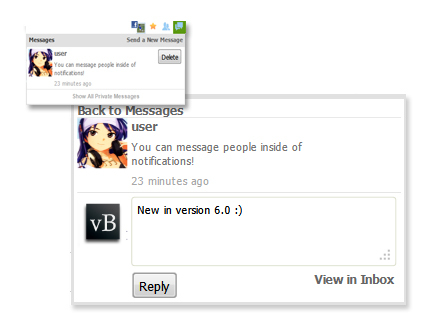 In 8.x, you can now send new messages as well as continue on-going messages. 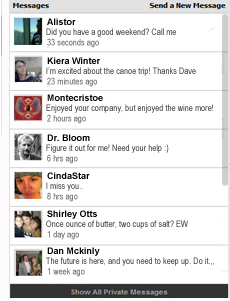 With built in messaging, you not only get messages in real time, you get to respond much faster. 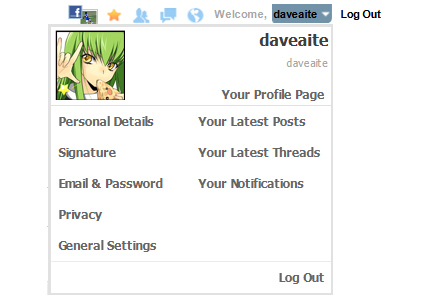 Forum users can easily change their avatar without changing pages. In 7.0, the global drop down changes to a settings panel. 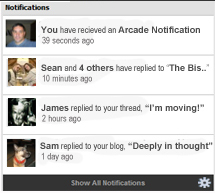 Now you can disable and enable notifications for over. It now supports 20+ different configuration options per user on the fly. 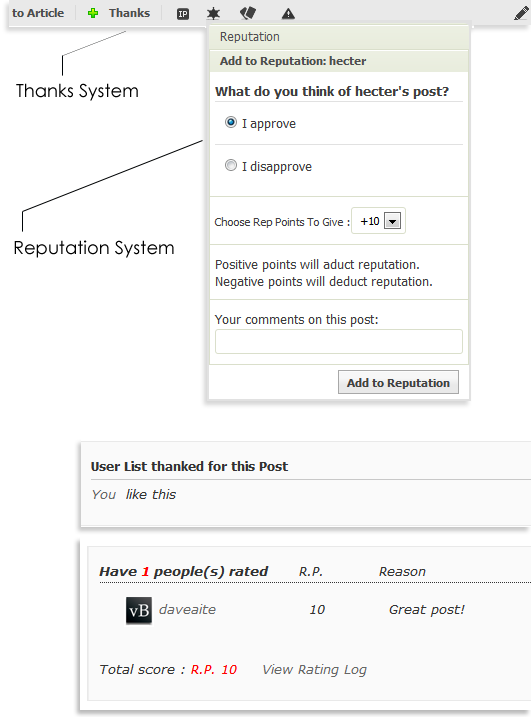 Similar to the Discuz platform, we’ve built a Social Reputation system, where users can leave quick comments, add/subtract reputation to other users based on their posts. This makes reputation building much more interactive! Ability to disable/enable. We’ve also built into the system a Thanks system for threads and posts similar to the many thank systems currently out there. Ability to disable/enable. Spoil your VIP’s with another exclusive benefit! Or give your moderators, supergroups a communication channel connected to Facebook. Increase user activity by giving them an incentive to create threads.